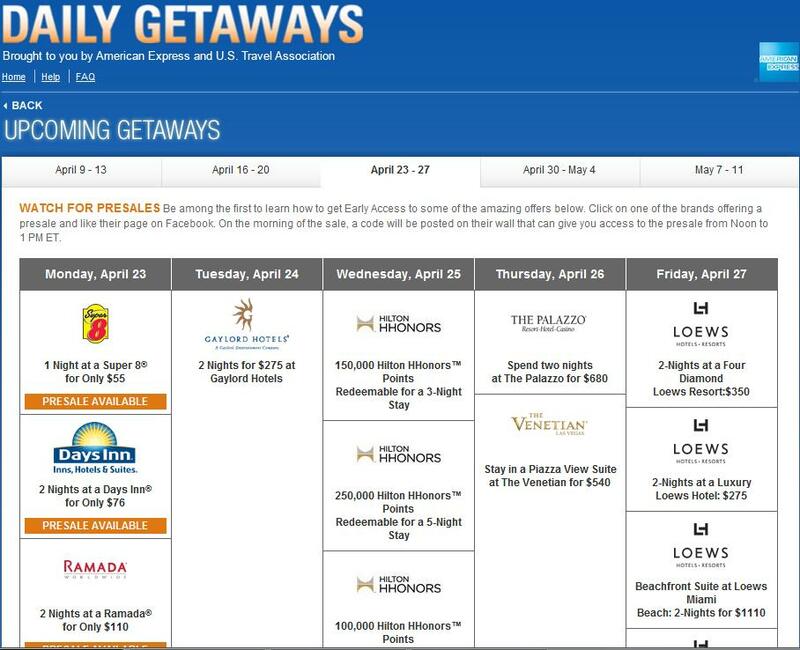 American Express runs a website called “Daily getaways” where they offer daily deals. On Monday April 23rd at 10:00AM Pacific Time they are running an offer I urge you to look into. Wyndham hotels is selling nights at their different brands but what you are actually buying is Wyndham reward points. These points are interchangeable into Aeroplan, American Airlines AAdvantage, United MileagePlus, US Airways and a few other airlines from around the world. The transfer ratio is 2.5 :1 so if you had 25,000 Wyndham points this would turn into 10,000 points to your mileage program. If you were to buy each of the 5 different offers this would cost you $494.10 on your American Express (add 10% if you use a different credit card). In turn you would receive 174,000 Wyndham points which is 69,600 airline miles. If you were to transfer these to American airlines points this would be enough for a business class flight from Canada to Venezuela round trip and I found many dates available at this redemption level in May and June. This is also enough for a one way First Class trip from Canada to China and I even saw many dates available during July and August which is peek travel season. Excellent value for under $500. Another more basic option would be to buy the Days Inn or the Wyndham hotels and resorts package (The 2nd and 4th options). This would cost you $181 if you pay with AMEX and net you 26,400 airline miles. This is enough for a ticket to anywhere in the Continental USA and Canada. Another benefit is since the Wyndham points are transferable to Aeroplan, American AAdvantage, United or US Airways your options for finding a flight are multiplied. You are able to search and see availability before you have the points in your account. Go to either www.aa.com/aadvantage, http://www.united.com/web/en-US/apps/booking/flight/searchAward.aspx, https://www1.aeroplan.com/adr/AirBooking.do and enter the locations and dates you would like to travel. You can then see your options before you commit to spending any money. If you are curious about flying to other locations and would like to find out how many miles it will take just google “redemption chart” of the respective airline frequent flyer program. If you are planning to travel with someone else make sure to search for 2 seats so you end up travelling together. Lastly if you plan to pursue this offer make sure you open a free Wyndham reward account ahead of time. Be ready to buy right when this offer opens because it will sell out fast, last year it sold out in 6 minutes. This entry was posted in Bonus Points and tagged Aeroplan, Air Canada, First Class, Points, travel, Wyndham. Bookmark the permalink.